For the most part, Nebraska quarterbacks coach Mario Verduzco is focused on his guys. You know, the quarterbacks. He’s got a battle to tend to. He tries to stay laser-focused on the ones throwing the ball. But throughout the start of fall camp, he has noticed a handful of times one of the guys running the ball. “I will say that the couple times that I’ve seen Maurice, he’s like ‘boom,’ he’s out,” Verduzco said Wednesday after practice. Maurice being freshman running back Maurice Washington. The guy that worked hard over the summer to get academically admitted into Nebraska and get an academic waiver to play right away. The guy who teammates are gushing about left and right. During the open portion of Wednesday’s practice, the media got to see Washington’s game firsthand. He had a pair of runs during team drills that flashed a burst and ability to get upfield in a hurry. When the team broke into a revised Oklahoma drill, Washington took a handoff, immediately cut right to avoid one defender and then quickly spun back left to beat the second. The physicality aspect is interesting because Washington currently is pretty slight for a Big Ten back. 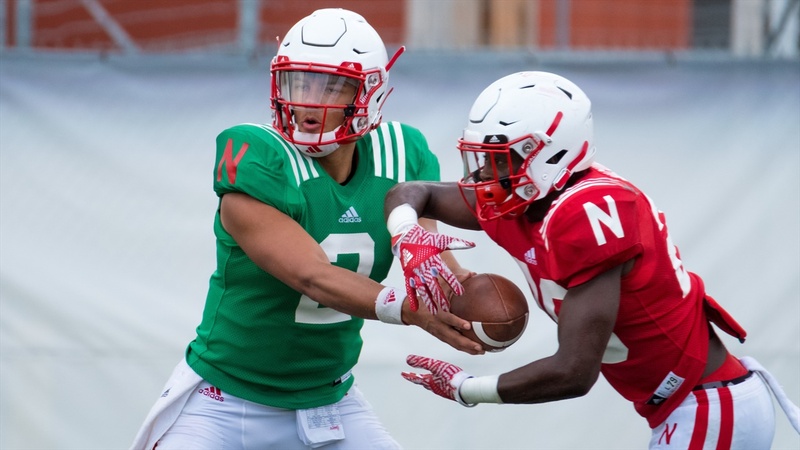 The Huskers’ official roster lists him at 6-foot-1, 190 pounds, but standing next to a guy like Greg Bell (listed at 6-feet, 205) that feels like a stretch. Washington is long, but thin. Offensive coordinator Troy Walters said ideally they’d like to add some muscle to his frame (which, inevitably, they will; Washington has that kind of frame) but they’re comfortable in his ability to play right away. The main goal this season with Washington seems to be getting him ready for college life and keeping him grounded. That was a word Held used in talking about tempering expectations for what the true freshman could do in Year 1. There’s plenty of excitement around the former 4-star, but he’s playing a little bit of catch-up right now. Walters was asked what he would like the carry splits to look like over an ideal season and he didn’t give away much, just adding they used four backs at Central Florida and that would likely be the M.O. again in Lincoln. Washington is talented and they’re rightfully excited, but Nebraska has other talented backs, too. It’s just Washington is the newest. “I didn’t know what to expect, that was something I was kind of worried about,” quarterback Adrian Martinez said. “He got here, they put him through some testing and some things he needed to do before he could practice and I wasn’t sure but when we first handed him off the ball and I saw that acceleration and that quickness, we found out. For his part, Walters says Washington has taken it upon himself to put in extra time. He’s seen Washington staying on the field to run through things again and staying in meeting rooms to ask questions. “Maurice has done an incredible job coming in late, not really having a summer to get in shape and to go through the playbook,” Walters said. “He’s special. When he’s out there, he has another gear. He has some instincts that you just don’t coach. Guys have it or they don’t.